The name for the area, The Catwalk, refers to the original plank-board walkway placed atop the steel pipe that used to bring water to the ore processing plant, ruins of which can still be seen near the parking area. 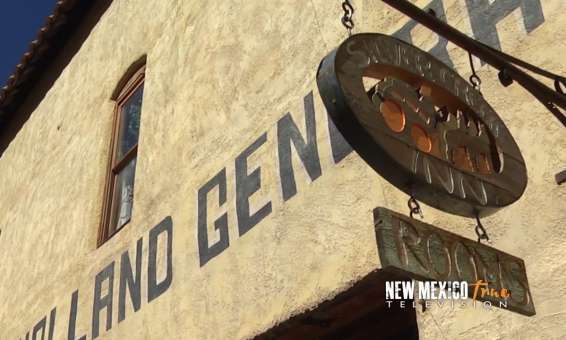 The trail offers a fascinating glimpse into the geologic and historic foundations of southwest New Mexico. The result of cataclysmic volcanic actions, the area now offers a beautiful picnic spot next to Whitewater Creek, a challenging one-mile trail along the historic 1890's mining waterway, and a sense of place that creates images of an earlier time. The name for the area, The Catwalk, refers to the original plank-board walkway placed atop the steel pipe used to bring water to the ore processing plant, ruins of which can still be seen near the parking area. 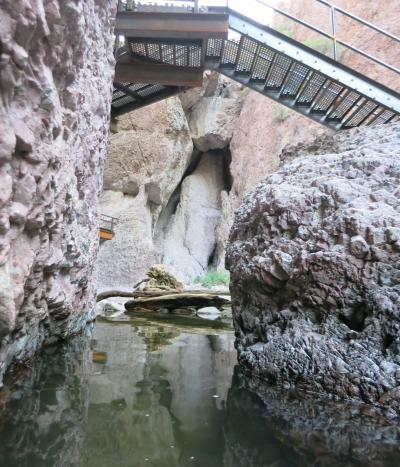 Although most of the pipe is now gone, much of the modern all-access trail follows this original route, winding right through the center of the creek canyon perched safely a dozen feet above the creek. Keep an eye out for trout cruising in the waters below. 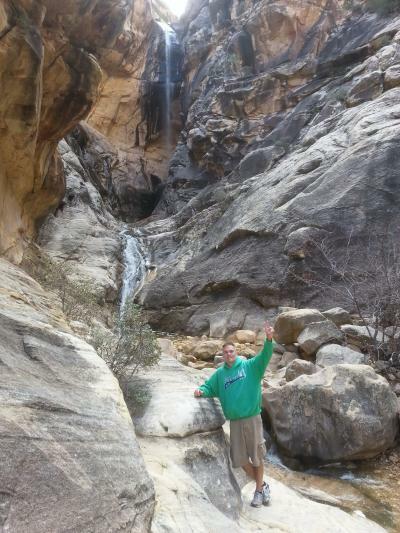 The first portion of the trail is relatively easy and leads to hidden pools and splashing waterfalls — magical spots in our high desert environment. Beyond the developed trail, more rigorous trails lead into the Gila Wilderness. Consult with the Forest Service before venturing beyond the Catwalk trail area. The Catwalk Recreation Area is a day-use area and is open from sunrise to sunset. A parking fee of $3.00 per vehicle is paid at a self-pay station in the parking lot. Camping is available elsewhere in the Glenwood area. Whitewater Canyon, site of the famous Catwalk, was a central point in the mining history of this area. The town called both Graham and Whitewater grew up around a mill built by John T. Graham in 1893 and lived less than 10 years. All that remains to mark the spot is part of the mill walls still clinging to the west side of the canyon near the entrance to The Catwalk. The mines above the canyon were worked from their discover in 1889 until 1942 (Billy the Kid&apos;s stepfather, William Antrim, was a blacksmith at Graham). The Helen Mining Company was first to develop 13 claims about 4 miles upstream from the mill which could not be built closer to the mines because of the rough, narrow canyon. A 3 mile long, 4" metal pipeline provided a continuous water supply to the town and its electric generator. Although a larger 18" pipeline was built in 1897 to run a big, new generator, the present day Catwalk follows the route of the original line. Pipe used in the water line was delivered to the site on wagons drawn by teams of up to 40 horses. Ore was pulled down the mountain to an ore chute on the ridge just above the mill by smaller teams. Brace holes were drilled into the solid rock walls, sometimes 20 feet above the canyon floor, to hold the timbers and iron bars that supported the smaller water line along its meandering course. Some of the original 18" pipes support sections of the present Catwalk. The massive rock walls of Whitewater Canyon saw few visitors until the Civilian Conservation Corps. was assigned the task of rebuilding The Catwalk as a recreation attraction for the Gila National Forest.